The Mabinogion are a collection of eleven prose stories that have a very large presence in Welsh literature. Drawing on pre-Christian Celtic mythology, folklore, and early medieval traditions, each of these tales is the product of a longstanding Welsh narrative tradition, and has been widely influential, especially since their translation into English. At the heart of the Mabinogion – the name given to this collection, as compiled and translated in English in the 19th century by Lady Charlotte Guest – is the four branches of heroic tales that make up the Mabinogi proper. The fourth branch, Math Fab Mathonwy (Math, son of Mathonwy) is the tale that has been re-imagined in Gwyneth Lewis’ The Meat Tree, one of Seren Books’ new stories from the Mabinogion collection. In the traditional tale, we are told the story of Math, King of Gwynedd. Math is a cursed man, condemned to have to rest his feet in the lap of a virgin if he wants to stay alive, only being permitted to rest his feet upon the ground when his kingdom is at war. He is thus served by his footholder Goewin, alongside his nephews Gwydion and Gilfaethwy. Inevitably, Gilfaethwy is in love with the beautiful Goewin, and so he and his brother contrive to start a war with Dyfed so the king can leave Goewin; he wooing does not go quite according to plan, however, and Goewin ends up being raped. When Math returns home and learns of what has happened, he in enraged and being a powerful magician, he turns Gwydion and Gilfaethwy into beasts and condemns them to live in the forest for three years, bearing a child each year to be turned back into human and raised in Math’s court. Upon their return to court, the chastened Gwydion seeks to make amends by proposing his sister Aranrhod to be the king’s new footholder. Aranrhod is duly brought to court, but has to pass a test for virginity to ensure it is safe for her to serve as footholder. The king lays down his magic wand and asks Aranrhod to step over it. This she does, but the magic tricks her into giving birth to a boy, thus proving she was not a virgin. The angry Aranrhod curses the baby, who Gwydion now seeks to bring up and free him from this magic – first by forcing her to name him Lleu (light), secondly by letting him bear arms, and thirdly by creating a magic wife for him, as his mother has condemned to never marry within his own race. Math and Gwydion work magic to create a woman of flowers who they call Blodeuwedd – but almost inevitably a happy ending is not possible between her and Lleu. This is clearly a fantastical tale, set in a bizarre and magical landscape, and I was curious to see how it could be handled in a modern reworking. Lewis’ solution was to transport this medieval tale into the year 2210 and give it a science fiction twist. In this story, the large cast of characters has been reduced to just two – Campion, the Inspector of Wrecks, and his new apprentice Nona (given that Campion is a flower and Nona is the Fate that spins the web of life as well as being the Roman goddess of pregnancy, I hardly think these names were chosen as random). The story is set as Campion leaves on his last mission to inspect a wreck that has appeared in orbit around Mars, his task to find out what happened to it and salvage anything useful. So we are set with a classic science fiction tale, with a not unusual veteran/novice trope. Arriving on board the ship, the two find it deserted, despite the log indicating there should be a crew of three – “Where are the bodies? Not even three piles of dust for us to analyse. No sign of forced exit, no breach in the spacecraft’s hull. Nothing for us to go on.” The classic locked room mystery, then. The only thing that remains as a clue aboard the ship is a virtual reality system that tells a strange story of a king that requires a footholder, of two brothers turned into beasts, of mothers cursing their sons and most strangely of all of a wife conjured from flowers. 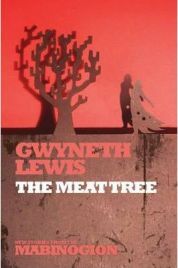 Lewis’ approach to this story in The Meat Tree is an interesting one; the idea of a virtual reality story set within a fantasy future certainly manages to handle the odd and unreal elements of the fourth branch and make sense of them within the world she has created. The entire story is told as conversation between the two characters; although more as series of monologues that a dialogue as you might see or hear in more conventional drama. The contrivance is that the characters are describing their surroundings for a ship’s log of their investigation, which for the most part works, but does occasionally make them sound staged, rather like two television presenters trying to convey their experiences stiffly back to their audience. At times I liked it, but there were places – especially when deep into the complexities of the story within the virtual reality – when I felt more conventional prose would have been not only clearer for the reader, but also somewhat more enjoyable. This is book that is clearly intended as a work of art rather than the sort of cosy fiction you can curl up with on a sofa of an evening (perhaps not surprisingly, the author is a poet, and indeed composed the poetry that adorns the Millennium Centre in Cardiff). That is not to say that I didn’t enjoy it, more that you need to approach it with the correct frame of mind to get the most out of it. The result is something that is not very long – 250 pages, but much of that is white space – so it feels more like an episode of a science fiction show than anything else. That is not a bad thing. It is perfectly enjoyable as it stands, a good adaption of source material, has some nice use of language and it ties up everything quite neatly to give a satisfying ending. However, it is missing a certain something and I wouldn’t say it was a classic. If you are looking to further understand the Mabinogion, however, you could do a lot worse than this as an approach to the fourth branch. With thanks to Seren Books for providing me with this review copy. No Comments on "The Meat Tree"
« Where Did That Baby Come From?